Hope you are having a great Monday! Filling in for John and Ken on KFI AM 640 this Monday and Tuesday with Morris Will O’Kelly from 3-7pm pacific! Kerri Kasem has been interviewed on countless interviews, magazines and articles. Here she describes not being able to see her father, Casey Kasem, the last year of his life, which some have described fits into the category of elder abuse. Protecting Your Wealth and Family as heard on KABC radio with Naz Barouti. Naz says, “Let’s face it, we ALL need to plan for the future and PROTECT our assets and, most importantly our family after we pass but most of us don’t want to face the inevitable so we avoid having these conversations and thus remain uncertain how to even start the process.” Kerri Kasem and the Kasem Cares Foundation is a voice for the people. Naz: Today we are talking about Casey Kasem. 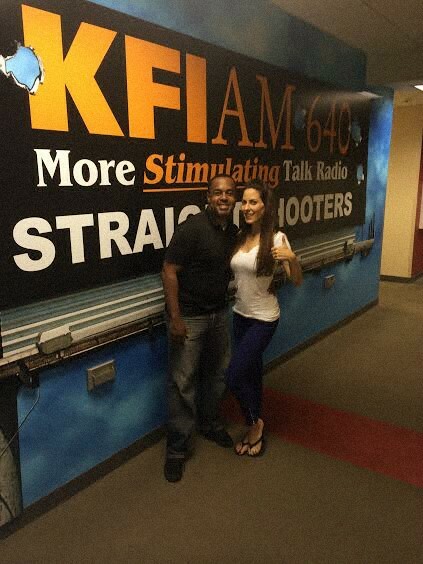 I’m so honored to have Kerri Kasem in the studio. Thank you so much for joining us in the studio today. I really wanted to provide you with as many outlets as you can have to tell people what’s going on and how you have been prevented from seeing your dad. You’re listening to Protecting Your Family on Talk Radio 790 KABC. I’m your host and estate planning attorney, Naz Barouti. Kerri: Yeah, you know it’s gotten out there quite a bit and I’m thankful for that. I’m thankful for that because of one reason. There are so many people in this country going through the same thing that I’m going through; being prevented from seeing a loved one by that loved one’s spouse for no reason. I’m not going to say every kid deserves visitation rights to see an ailing parent, maybe they do cause that parent stress, may be they have done some bad things. When you have talked to your dad every single day of his life and you can see that parent whenever you want, to have that bond disrupted is inhumane. The bond with me and my brother and sister in our family was so strong; he would come to Christmases at my house and my mom’s house and my sister’s house, we were always doing birthday parties for all three of us kids together, we were always together. Even though my mom and dad were divorced we were always a family unit. First and foremost, it was family with my dad. His wife knows this. So for her to say, “Oh, the visits were intolerable, or those kids know what they’ve done.” It’s sick, it’s disgusting, it’s evil, and it is cruel intentions to say that. He’s dying alone in a convalescent home and we’re not able to see him. And it’s not just the kids, it’s all of his family; his cousins, his brother can’t see him — none of his friends can see him. Nobody that loves him can see my father, nobody! Naz: And you said that a lot of kids may not deserve to see their parent, I know that some children have issues. Some may have alcohol or drug problems and such children cause their parent stress. At the end of the day, the love you have for your child, no matter what they do to you, they’re your flesh and blood, you created them. So I can’t think of any awful thing that you and your siblings could do that would prevent your father from wanting to see his kids when he’s sick like this. Kerri: My father told the court a few months ago, “I want to see my children.” Some of these records are sealed so I can’t say what he said. As soon as he said what he said, he got kicked out the house and put in a hospital far away from his house with a guard at the door, so nobody could see him. Naz: I mean that’s just insane, who is she protecting? She’s acting like the president is in the hospital. Kerri: Even worse, if the president were in the hospital at least he’d get to see his family. It’s a sickening, disgusting situation, and people try to rationalize it, like, oh, the kids must have done something, the kids want money. We’ve been in court for 6 months and we’ve never asked for a dime. Naz: You siblings have your own success; your sister is in the medical field? Kerri: Yes, she’s a physician’s assistant, her husband is a doctor; he’s a cardiologist, my brother has a number one radio show in Asia- Singapore, he hosts the American Idol out there. Mike Kasem has another television show and he’s very successful. I’m successful in my own right; none of us take a dime from our father. Naz: I’ve been doing this for a while now, and I can tell, when certain people come into my office if that child genuinely loves the parent or if they’re after something else. I can read people, this is the first time I met Kerri, but I can guarantee you, I don’t see any signs that you and your siblings want money. I think it’s been pretty clear and established. I read reports that you said your father already has a trust and has certain things distributed to certain people, so I don’t think that’s an issue. If that were an issue, you’d be fighting about the trust, and what the terms of the trust are, and his capacity about creating the trust and how Jean is supposed to be excluded from everything. Kerri: I just want to see my dad. We’ve told her, keep it all, and take it all, we don’t care, just give us our dad. She wants that too, she wants to keep him. There’s something that is strange because I see this all the time in the press. When the judge declared my father to be getting good, excellent care, it was very upsetting. Of course he’s getting good, excellent care. We called the adult protective service on him when we couldn’t see him for two months, remember we used to see him every week. All of a sudden; sorry, Charlie can’t see your dad, why? What’s going on, why can’t dad come over, what’s happening? Naz: She told you guys that? Kerri: Oh, no she wouldn’t answer any of our calls. She doesn’t talk to us, we had to talk to her assistant. Sorry he can’t come, sorry he can’t come, every week. Finally my sister went over there, knocked on the door and said, “I want to see my dad, what’s happening with my dad, why won’t you return our phone calls, why can’t I see my dad? I just want to put my arms around him, I want to love him, I want to take care of him. She turned to my sister and said; why do you care, you’re getting a million dollars.” And we’re not getting a million dollars, first of all. My sister looked at her and said, “Keep your money, let me see my dad, I don’t care about the money,” and she was escorted off the property. So we called adult protective services, and they were not allowed into the house. Nobody knows that. She did not allow anybody into the house. Naz: There must be a reason, if you have nothing to hide why not be an open book? Kerri: That’s right, so we called the police the next day. By that time, he was home, cleaned up and looked good, with the caretaker there. She had a warning. If they would have gone in they would have seen that he was not there because she sent him home with the housekeeper, or that he was not being taken care of very well. But that is not what happened. We have a judge who didn’t look at any of that. I’m not saying it’s our fault or this was bad, it’s the way the evidence was presented. And it’s very upsetting because we knew what was going on in that house, and of course, now that she’s been caught, he’s getting good excellent care. Naz: But you know Kerri, that’s where I think that the system is failing is failing you, that’s where I feel like lawyers need to step up, judges really need to step up and see what’s going on, and they’re not doing it. I really urge all lawyers, when you get a client in your office and they come in with a second spouse, or even a first spouse, or one of their kids (when they have five) and something is getting changed or they’re drafting a new health care directive and they have no idea what’s going on. Because I feel that’s what happened with your dad. He had one in 2007 naming your sister and his son-in-law — because they have a medical background — and then a new one is draft in 2011. What idiot attorney would draft this new one? Kerri: And you can’t do irrevocable. In 2009 my dad could not get through his American top 40 script. He couldn’t understand it, he couldn’t read it all the way; he then had to retire in 2009. In 2010, he couldn’t tell you where he got married, he had good days and bad days, some days he was more lucid with it, some days he wasn’t. Kerri: You can’t understand it because it is irrational, insane behavior, there’s nothing rational about this, and we haven’t done anything. You can’t rationalize it and I want people to stop trying to rationalize it, we’ve done nothing. Most of the time like 95% when stories get out there it’s very positive, once in a while I’ll see stuff that looks like it’s coming directly from my father’s second wife. These kids have a history of drug addiction, it’s documented; my sister has never done drugs in her life. I experimented 20 years ago, I’ve said that on air, but I don’t have a history of drug addiction, neither does my sister, neither does my brother. The lies are really trying to, in every single way, hurt us across the board. I’ve heard her come out and say that she’s a private person, but I’ve also read reports that she was trying to get on the Real Housewives of Beverly Hills. That’s right, go to TMZ, she looked straight to the camera, and this was while my father was dying. He was dying, this was a year ago; and she says, “Well, I’m in talks with the housewives of Beverly Hills, breaking news. My dad is dying in the house and she wants to bring in a bunch of cameras, and she wants to bring in a show full of drama while my dad is sick, and she’s telling us we’re the ones who will be toxic to him. Naz: That’s why I’m wondering — how is she a private person if she would agree to be on a reality TV show like Real Housewives of Beverly Hills or a reality TV show? It does not make sense to me. Kerri: She’s not a private person; I’m not going to say what my opinion is. If I did I would say, I think she’s a money hungry, stepmom witch. I can say it I don’t owe her anything and this is the first time I’ve met you so you haven’t pushed me to say these things. These are just things I feel, and I think a lot of people feel. More than 15 years ago we weren’t allowed in the house to talk to my step sister — not allowed at all. I don’t even know her at all. I don’t get it, since we were little children she has done things to us. I talked about this on the TV shows; when I was eight years old I had this penguin that I sleep with every night, my dog chewed the beak on it. And every weekend we were with my dad Friday, Saturday, and Sunday. We were with our mom during the week. And I brought it over and she was like, oh, what happened to your bird, if you leave your sleepy toy with me over the week, I’ll fix it for you and give it back. I wanted her to like me so bad that I left my security blanket with her, hoping that she was going to do that. I come back the next weekend she had thrown my sleepy time toy, my bird, my safety blanket, to her dogs as a cheap toy. I have to say that it’s so important to get your estate plan in order. Please, if you are married a second time, a third time, a fourth time, even if you are married to your first husband; please get your affairs in order. I’ve talked to so many people who do elder law and they say never does the husband realize that their second or third wife is not going to take care of their kids. Every single time, every single time it seems it doesn’t happen. They don’t take care of the kids, they take care of their own. Naz: Last week we did a tribute to your dad and we played a clip. I found this really amazing clip of his voice, talking about his career and the people that he worked with. It signifies how far he’s made it. He worked with amazing people. He just seems like such a wholesome person. Kerri: He’s a good man. Naz: I grew up listening to his voice; his voice will always be imprinted in my head. It’s just like a memory and I think a lot of people have that memory. I think that you can just tell what kind of person he is, like he doesn’t have a bad bone in his body. Kerri: I have always said about my dad when people ask, “What’s your dad really like?” “He’s like Gandhi. He wants peace.” He’s very lovely, he’s extremely generous. Anybody that would walk up and talk to him, he’d always have time for them, always. And if he didn’t, he said, hey, here’s how to get in contact with me, or I’ll send you a picture. He was so grateful for his listeners and so grateful for his career, and he’s an incredible man that does not deserve to be dying alone in a convalescent home. Naz: When we come back I want to talk about the bill that you’re trying to get passed. I want to talk a little bit more about the condition that your dad is suffering because I don’t think we’ve talked about that, and some of the symptoms that I’ve looked up, of what can happen when you’re suffering from that. Naz: For all of you that have been remarried or you have children from a previous marriage, please get your estate-planning documents in order. Please make sure that you have a health care directive if you don’t want your spouse to make medical decisions for you, and you want a child to make the decisions. Have in order: your trust, your will, your health care directive, and your power of attorney. All right, Kerri, I want to talk about your dad’s condition because I searched what the side effects are. Some of them were memory loss, dementia, and I’m still trying to wrap my head around the fact that he had a health care directive in 2007 when he got diagnosed and then 2011 a new one was drafted. It’s my understanding that that’s a form of incapacity, so I don’t know why the judge would accept the 2011 health care directive naming his wife to make decisions for him. I have no idea why that would even happen. Kerri: I don’t know if she actually accepted it, but we didn’t have a trial and there’s no evidence because the doctor that was supposed to look at my dad’s medical records was not paid by my father’s wife, so we couldn’t look into his medical records. He could have made the decision, but there’s no way he could have signed in 2011, which I think he would have, that’s my opinion. Because in 2009, like I said before, my father couldn’t get through his top 40 script, couldn’t do it. In 2010, he couldn’t tell you where he got married half the time. In 2011, there was no way could he read and understand an estate plan, a conservatorship, and a durable power of health, no way, it’s not possible. Naz: I don’t think it’s possible either, I saw a video of you last night that really affected me and it brought tears to my eyes. You were outside you father’s home with his friends and family and they wanted to see him. You guys had signs, you were a small group, you weren’t doing anything rowdy, the signs weren’t anything bad and this police officer was called. In the video, you’re talking to the police officer and you looked so helpless in that, and you were trying to express to the police officer, “I just want to see my dad, I don’t know what’s going on with my dad.” It’s like you have this road block in front of you, and I know that you’re working on an assembly bill to pass. Please talk about that more and talk about your foundation and people that are KABC listeners that are listening, that want to get more information, they want to help you. Where can they go to get more information and where they can contact you? Every single one of these people tried to get in touch with him. These people were blocked for a year to two years prior. We were just blocked for a few months at that point. They were frustrated and fed up and they were so upset. Throughout the years, before we were blocked last July, if people wanted to get in touch with my dad they would call us, because Jean would never return a phone call or an email ever. These people said, “What’s going on?” My dad would come over to my sister’s house and his friends could see him there, and family could see him there and family flew out from Michigan to be a part of this. JEAN, WHY WON’T YOU LET ME SEE MY DAD? WHY CAN’T WE SEE CASEY? CASEY’S BEST FRIEND OF 63 YEARS.